Mad River is a professional river outfitter in Jackson Hole that has been running the Snake River for the past 40 years! One of the must-do adventures for any visitor to Jackson Hole is a whitewater or scenic float boat ride down the iconic Snake River. As its name suggests, the Snake River slithers its way past the magnificent Teton Range, through Jackson Hole and down into the steep canyons south of town. Its rapids are classified between I and III, making guided river trips with Mad River Boat Trips one of the best ways to experience this wildly beautiful body of water. Mad River is a professional river outfitter that has been running the Snake River for the past 40 years. With experience on its side, the rafting company can help make a river trip outing more than memorable. There are two ways to explore the Snake River: by scenic float or a whitewater trip. Mad River’s 13-mile scenic floats wind their way down a stretch of the Snake River that boasts one of the largest concentrations of bald eagles in the Jackson Hole area. The Tetons provide a breathtaking backdrop. The whitewater excursions bring you down the churning 8-mile section of the river that is not only rich in geological features but also includes no fewer than eight rapids of varying degrees of hold-your-breath action. Either river tour provides participants the opportunity to see Jackson Hole from a unique and special perspective. Mad River prides itself on the professionalism and friendliness of its river guides, all of whom have either a Wilderness First Aid or Wilderness First Responder medical certification. A bonus is the fact that the average amount of years a guide has been with Mad River is eight—and the majority of river runners are year round residents of Jackson Hole. This means they are invested ambassadors of our magical area of Wyoming. Mad River also has the longest-running river guide school in Jackson Hole. Mad River guides are well versed in the fauna, flora and history of the area—and the Snake River in particular. In addition, Mad River maintains a library of books about the Snake, the indigenous wildlife and more, and encourages its guides to take advantage of the resources available. River trips take place between May and September. Scenic floats are 3 hours in length, launching at 8:15 a.m. and 12:15 p.m. (The 12:15 trip includes a deli box lunch). Cost: $72 per adult; $52 for children age 4 and older. Whitewater trips last 3-1/2 hours and launch times vary depending upon the size of the boat and date trip is booked. Cost: $99-$109 per adult; $59-$94 for children age 6 and older. The high water conditions on the Snake River dictate the intensity of your whitewater adventure—especially in late spring and early summer due to the snowmelt from the mountains. But make no mistake about it: Mad River’s goal is to give you the thrill of a lifetime no matter how high or low the river is running. The fun on the Snake is complemented by the range of wildlife you’ll see, including osprey, eagles and river otters as well as the occasional mule deer or mountain goat, among other four legged residents of Jackson Hole. Even better, Mad River is the only outfitter that has its own meal site on the whitewater section of the Snake River Canyon. There are various riverside cookout packages offered, which allow for an unforgettable trip down the canyon. This season (2017), a trained chef is preparing the 3:30 p.m., four-hour Small Boats Riverside Cookout whitewater trip. A recent addition to the menu is cornmeal crusted catfish with spicy red pepper remoulade. Curry crusted Utah steelhead trout is another entrée to choose from, as is Bavette steak with horseradish cream. Complementing the meal are Dutch oven buttermilk biscuits, currant and farro "ragout," honey glazed heirloom carrots and balsamic grilled asparagus. A mixed berry cobbler completes this special dinner experience! Boats range in size from the “super-small” 6-person craft up to the standard size raft that can accommodate up to 16 people. This larger size boat has both paddling and non-paddling positions; the smaller rafts require all participants to paddle. Special solar eclipse trips are being offered on August 21–eclipse "day." Both 8-person and 16-person rafts are available for this special excursion; the price for a spot on an 8-person raft is $323.80 and the price per spot on a 16-person raft is $299.80. This specialty trip is all-inclusive and includes transportation to and from the river, wetsuits and booties (when requested), guide gratuity, all taxes and fees, a riverside meal and special solar eclipse viewing glasses. The check-in location for trips is at Mad River’s office at 1255 So. Highway 89, just 2 miles south of Jackson Hole. 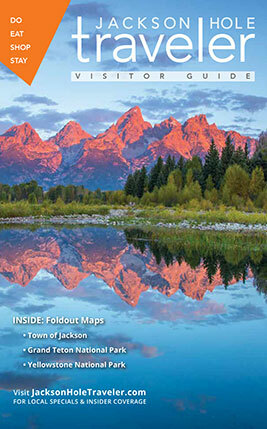 Complimentary pick up is also available at most Jackson Hole and Teton Village lodging locations. For more information, call Mad River at (800) 458-7238, or visit mad-river.com.